CAUTION: Do not quit any medication without discussing it first with your physician. Likewise, do not add any supplement without first discsussing it with your doctor if you have an underlying medical condition or any current medicaitons. 1. Testosterone. A few savvy practitioners out there are now screening depressed men for low testosterone levels. Why? Because depression has been shown in numerous studies to be linked to low T and, furthermore, giving a man HRT (testosterone therapy) can often improve his depression. I am living proof of that one! To see some of the research, check out my link on Testosterone and Depression. Again, the reason that testosterone is so helpful in this area is that testosterone stimulates many neurotransmitters, including dopamine, and is just good for male brain health as you can see in my link on Testosterone and the Brain. 2. Nutrition, Supplements and Exercise. There are actually many nutrients that, when low, can create or worsen depression. Your brain is a huge energy hog and requires massive amounts of vitamins, minerals, fatty acids, amino acids, antioxidants, anti-inflammatories, etc. in order to run effectively. It is too much to cover here, but I discus all of this in my link Natural Depression Cures. Put these small things together and they can make a huge difference. 3. Meditation and PMR. There is a strong and underemphasized cortisol/stress/anxiety component to depression. This aspect of depression responds very well to stress management techniques. These take just a few minutes out of the day and are also just good for general health. See my links on Secular (Non-Religious) Meditation, Mindfulness Meditation and Progressive Muscle Relaxation for the basics. 4. Thyroid. Hypothyroidism can cause or worsen depression. Unfortunately, most doctors do not do an extensive evaluation and so I urge you to read this link on The Many Causes and Ways to Diagnose Hypothyroidism for some good starter information. Of course, sometimes depression is severe and incapaciting enough that it requires some kind of medical or psychological intervention. Don't put off treatment if you need it: depression is very hard on the body. It elevates inflammation levels, cortisol, free radicals and is so hard on the brain that it can damage the hippocampus and possibly other neurological regions as well. 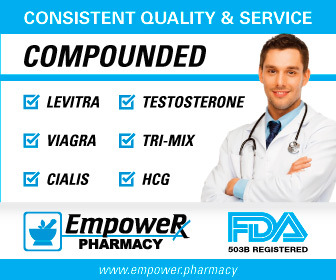 It also may lead to hypgonadism in some cases and can lead to difficulties in the bedroom as I document in my link on Depression and Erectile Dysfunction. Obviously, that is only going to make a bad situation worse. So, if you are struggling with depression, it's important to face it and defeat it. Again, stop by The Peak Testosterone Forum if you have any questions or comments.